A lot of people who have discovered masonry heaters first discovered them as a box, like the heater at left. What I mean is that, chances are, they read about them somewhere (other than my book) and the accompanying photo or drawing was of a big, rectangular box. I call it the refrigerator. I find it disappointing that most people's first exposure to these amazing appliances leads them to believe that, if they want a masonry heater, they need to find somewhere in their home to fit in a big, clunky box. Now, don't misunderstand. I built that box that you see here. And it works just great thank you very much. And for all of you who love red brick and rectilinear shapes, I'm sure you find this very attractive. 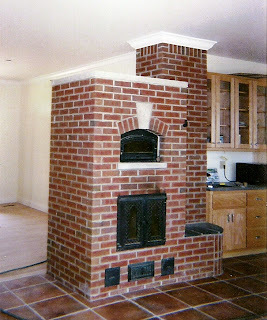 But I still think that this rectangular red brick box should not be the way people are introduced to masonry heaters. The picture below proves that it is not the case at all that you have to have a box to have a masonry heater. This wonderful sample (and you can find even more such samples at http://www.kachelofen-stoisser.at/kacheloefen.php where this photo was pulled) of how masonry heaters become artwork, fun, and a centerpiece while also being the true heart of the home. 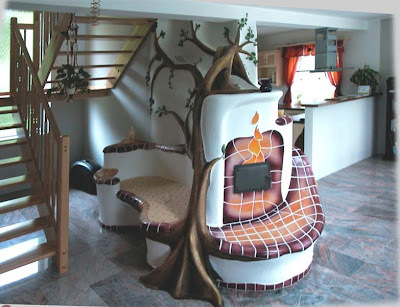 Here, free-formed plaster tree branches meld with the heater in every direction and colorful, handmade tiles create visual interest without destroying the soft lines of the rounded surfaces of the masonry heater. Most of us, when we think of tiles, think of square, uniform, flat surfaces. A handcrafted masonry heater like this proves that everything is not always what we expect. Masonry heaters do not need to be big boxes. They don't need to be intrusive behemoths in the living space. Quite the contrary, they should be a magnet for people. Think about your own human body. Can you point to any distinct, sharply defined rectangles or squares on the surface of your body? Obviously not. The whole human form is a continuum of rounded soft forms. But more importantly, in addition to its soft roundness, the living human form is warm. Most people eventually find a mate who is attractive to them. What is attractive about one's mate is both their form (physical) and their warmth (physical, emotional, and intellectual). Masonry heaters, too, can (and should) hold that attraction. 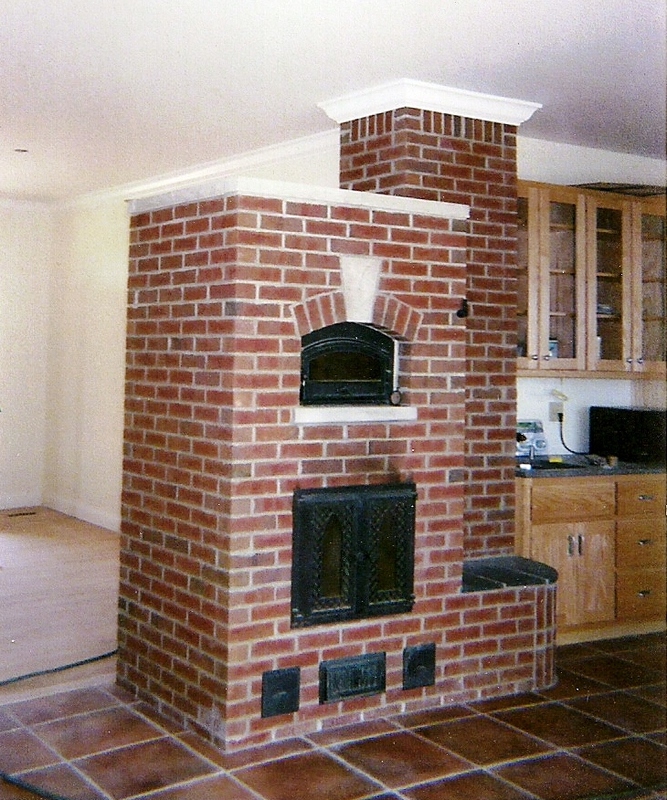 Someone who wants a masonry heater should choose the form most appealing to them. If you are attracted to big boxes made of bricks, then certainly that is what you should get. But if gentle curves and organic shapes are more appealing to you, you're in luck because masonry heaters can be that, too! As I explain in Masonry Heaters: Designing, Building and Living with a Piece of the Sun, a masonry heater can be almost any shape. I start with a container that is appealing to the owner-to-be. Then my job is to fill the container with the parts that will turn that appealing form into a living, breathing and warm masonry heater. There is nothing else like it in the world of space heating.